In this primer we’ll get a first taste of the mathematics that goes into the analysis of sound and images. In the next few primers, we’ll be building the foundation for a number of projects in this domain: extracting features of music for classification, constructing so-called hybrid images, and other image manipulations for machine vision problems (for instance, for use in neural networks or support vector machines; we’re planning on covering these topics in due time as well). But first we must cover the basics, so let’s begin with the basic ideas about periodic functions. Next time, we’ll move forward to talk about Fourier transforms, and then to the discrete variants of the Fourier transform. But a thorough grounding in this field’s continuous origins will benefit everyone, and the ubiquity of the concepts in engineering applications ensures that future projects will need it too. And so it begins. The secret of the universe that we will soon make rigorous is that the sine and cosine can be considered the basic building blocks of all functions we care about in the real world. That’s not to say they are the only basic building blocks; with a different perspective we can call other kinds of functions basic building blocks as well. But the sine and cosine are so well understood in modern mathematics that we can milk them for all they’re worth with minimum extra work. And as we’ll see, there’s plenty of milk to go around. The most rigorous way to state that vague “building block” notion is the following theorem, which we will derive in the sequel. Readers without a strong mathematical background may cringe, but rest assured, the next section and the remainder of this primer require nothing more than calculus and familiarity with complex numbers. We simply state the main idea in full rigor here for the mathematicians. One who understands the content of this theorem may skip this primer entirely, for everything one needs to know about Fourier series is stated there. This may also display to the uninitiated reader the power of more abstract mathematics. 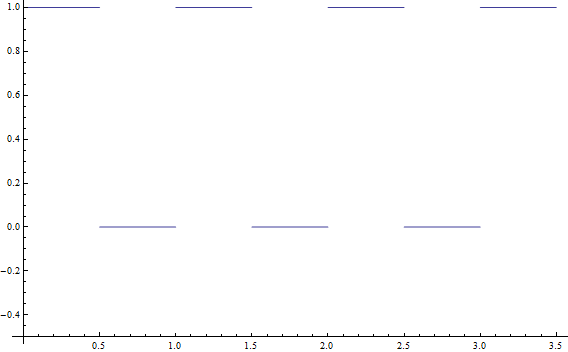 And the projection of a function onto this basis gives the Fourier series representation for . Of course, those readers with a background in measure theory and linear algebra will immediately recognize many of the words in this theorem. We don’t intend to cover the basics of measure theory or linear algebra; we won’t define a measure or Lebesgue-integrability, nor will we reiterate the facts about orthogonality we covered in our primer on inner-product spaces. We will say now that the inner products here should be viewed as generalizations of the usual dot product to function spaces, and we will only use the corresponding versions of the usual tasks the dot product can perform. This author prefers to think about these things in algebraic terms, and so most of the important distinctions about series convergence will either fall out immediately from algebraic facts or be neglected. On the other hand, we will spend some time deriving the formulas from a naive point of view. In this light, many of the computations we perform in this primer will not assume knowledge beyond calculus. Fourier analysis is generally concerned with the analysis and synthesis of functions. By analysis we mean “the decomposition into easy-to-analyze components,” and by synthesis we mean “the reconstruction from such components.” In the wealth of literature that muddles the subject, everyone seems to have different notation and terminology just for the purpose of confusing innocent and unsuspecting mathematicians. We will take what this author thinks is the simplest route (and it is certainly the mathematically-oriented one), but one always gains an advantage by being fluent in multiple languages, so we clarify our terminology with a few definitions. Definition: A signal is a function. For now we will work primarily with continuous functions of one variable, either or . This makes sense for functions of time, but many functions have domains that should be interpreted as spatial (after all, sine and cosine are classically defined as spatial concepts). We give an example of such spatial symmetry at the end of this primer, but the knowledgeable mathematician will imagine how this theory could be developed in more general contexts. When we get to image analysis, we will extend these methods to two (or more) dimensions. Moreover, as all of our non-theoretical work will be discrete, we will eventually drop the continuity assumption as well. Also just for the moment, we want to work in the context of periodic functions. The reader should henceforth associate the name “Fourier series” with periodic functions. Since sine and cosine are periodic, it is clear that finite sums of sines and cosines are also periodic. Definition: A function is -periodic if for all . This is a very strong requirement of a function, since just by knowing what happens to a function on any interval of length , we can determine what the function does everywhere. At first, we will stick to 1-periodic functions and define the Fourier series just for those. As such, our basic building blocks won’t be , but rather , since these are 1-periodic. Later, we will (roughly) generalize the Fourier series by letting the period tend to infinity, and arrive at the Fourier transform. For functions which are only nonzero on some finite interval, we can periodize them to be 1-periodic. Specifically, we scale them horizontally so that they lie on the interval , and we repeat the same values on every interval. In this way we can construct a large number of toy periodic functions. Indeed, this is the most general possible sum of sines that maintains 1-periodicity: we allow arbitrary phase shifts by , and arbitrary amplitude changes via . We have an arbitrary vertical shifting constant . We also multiply the frequency by at each step, but it is easy to see that the function is still 1-periodic, although it may also be, e.g. 1/2-periodic. In general, since we are increasing the periods by integer factors the period of the sum is determined by the longest of the periods, which is 1. Test for yourself, for example, the period of . Before we continue, the reader should note that we don’t yet know if such representations exist! We are just supposing initially that they do, and then deriving what the coefficients would look like. Now we can rewrite the whole sum in terms of complex exponentials as follows. Note that we change the indices to allow negative , we absorb into the term (for which ), and we again shuffle the constants around. At this point, we must allow for the to be arbitrary complex numbers, since in the identity for sine above we divide by . Also, though we leave out the details, we see that the satisfy an important property that results in this sum being real-valued for any . Namely, , where the bar represents the complex conjugate. We’ve made a lot of progress, but whereas at the beginning we didn’t know what the should be in terms of alone, here we still don’t know how to compute . To find out, let’s use a more or less random (inspired) trick: integrate. Let us isolate the variable by first multiplying through by (where may also be negative), and then move the remaining terms to the other side of the equation. And now the task of finding the coefficients is simply reduced to integration. Very tidy. In fact, the process we went through is how one derives what the appropriate inner product for should be. With respect the this inner product, the exponentials do form an orthonormal set and this is trivial to verify once we’ve found the inner product. As we will say in a second, the coefficients of the Fourier series will be determined precisely by the projections of onto the complex exponentials, as is usual with orthonormal bases of inner product spaces. We will provide an example of finding such coefficients in due time, but first we have bigger concerns. A square wave, 1-periodic, but discontinuous at k/2 for all integers k.
This function is the characteristic function of the set . No matter how many terms we use, if the sum is finite then the result will be continuous, and this function is discontinuous. So we can’t represent it. “Ah, what about continuous functions?” you say, “Surely if everything is continuous our problems will be solved.” Alas, if only mathematics were so simple. 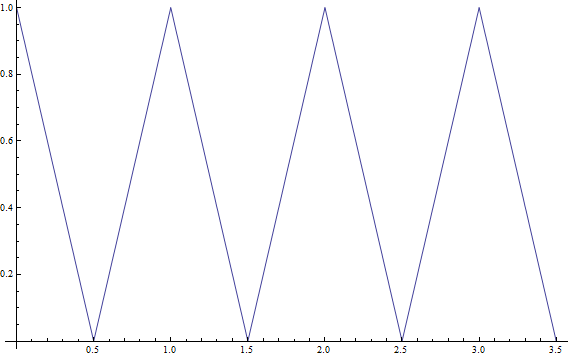 Here is an example of a continuous function which still cannot be represented: a triangle wave. A triangle wave. It’s continuous, but not smooth. This function can be described as the periodization of the piecewise function defined by and on the intervals , respectively. Unfortunately, these “sharp corners” prevent any finite sum from giving an exact representation. Indeed, this function is not differentiable at those points, while a finite sum of differentiable exponentials is. More generally, this is a problem if the function we are trying to analyze is not smooth; that is, if it is not infinitely differentiable at all points in its domain. Since a complex exponential is smooth, and the sum of smooth functions is smooth, we see that this must be the case. and is equal to for all . is finite. As it turns out, is a huge class of functions, and every function we might want to analyze in the real world is (or can be made to be) in . Then, of course, the pointwise equality of a function with its Fourier series (pointwise convergence) is guaranteed by the fact that the complex exponentials form an orthonormal basis for . Indeed, if we let be the termination of the Fourier series at (i.e. ), then as , the above integral tends to zero. This is called convergence in , and it’s extremely important for applications. We will never be able to compute the true Fourier series in practice, so we have to stop at some sufficiently large . We want the theoretical guarantee that our approximation only gets better for picking large . The proof of this fact is again given by our basis: the complex exponentials form a complete basis with respect to the norm. Moreover, if the original function is continuous then we get uniform convergence. That is, the quality of the approximation will not depend on , but only on our choice of a terminating . There is a wealth of other results on the convergence of Fourier series, and rightly so, by how widely used they are. One particularly interesting result we note here is a counterexample: there are continuous and even integrable functions (but not square-integrable) for which the Fourier series diverges almost everywhere. As we said before, there is nothing special about using the complex exponentials as our orthonormal basis of . More generally, we call a Hilbert basis for if it forms an orthonormal basis and is complete with respect to the norm. One can define an analogous series expansion for a function with respect to any Hilbert basis. While we leave out many of the construction details for a later date, one can use, for example, Chebyshev polynomials or Hermite polynomials. This idea is hence generalized to the field of “wavelet analysis” and “wavelet transforms,” of which the Fourier variety is a special case (now we’re speaking quite roughly; there are details this author isn’t familiar with at the time of this writing). Before we finish, we present an example where the Fourier series is used to solve the heat equation on a circular ring. We choose this problem because historically it was the motivating problem behind the development of these ideas. In general, the heat equation applies to some region in space, and you start with an initial distribution of heat , where is a vector with the same dimension as . The heat equation dictates how heat dissipates over time. Periodicity enters into the discussion because of our region: is a one-dimensional circle, and so is just the value parameterizing the angle . Let be the temperature at position at time . As we just said, is 1-periodic in , as is . The two are related by . The important consideration is that the symmetry of the circle has consequences in how the heat dissipates. Now let us write the Fourier series for . Where the constant depends on the physical properties of the region. See this page for a general derivation. This equation also called the diffusion equation, because it not only governs the dissipation of heat, but the diffusion of lots of quantities over time (e.g., charge in a wire). And this solves the problem. To convince you of some of the virtues of this representation, we can see that as tends to infinity, the first exponential goes to zero in every term, so that the whole expression goes to zero (regardless of is always positive). That is, no matter what the initial heat distribution is, after a long enough time all of the heat at any point will dissipate. So there you have it! Our main content posts in the future will use Fourier series (and more heavily, Fourier transforms) in analyzing things like music files, images, and other digital quantities. This entry was posted in Analysis, Linear Algebra, Primers and tagged complex analysis, fourier analysis, heat equation, mathematics, orthogonality, primer. Bookmark the permalink. The equation where you introduce a_k and b_k by getting rid of the phase terms should read “a_k sin(..) + b_k cos(..)” no? Your definition of primer differs wildly from mine. Sadly, yours is a primer for someone much more familiar with the terminology and concepts used than the typical person looking for a primer is. Not your problem, but rather mine. On one hand, I’m definitely orienting these primers toward mathematics because that’s how I understand the concepts. There are plenty and more with a focus for physics, engineering, or a general audience that you can easily find via Google. It would be pointless for me to reproduce those here. Instead, I laid the material out in the way that would have benefitted me the most when I started studying this topic. For instance, for someone of my level the “Bird’s Eye View” section summarized the entire article (indeed, makes most of the article superfluous) in a sentence. I don’t intend all readers to understand it, which is why I continue with an entirely naive explanation which requires nothing more than basic calculus. I do slip in some mentions of linear algebra (because essentially this is all just an instance of more general linear algebra), but I feel justified in doing so because I have covered the notation and ideas elsewhere on this blog. Finally, a blog post is necessarily more compressed and terse than, say, a course at a university on the subject. Indeed, the mere five posts we have written here on this blog correspond to almost a semester’s worth of the Stanford course on Fourier analysis. Fourier analysis, as with most mathematics, is a nontrivial subject. You have to work at it to understand it. I’ll gladly answer your questions if you have any, or refer you to a more elementary or slow-paced treatment, but you have to ask to receive. Possible error in Naive symbol pushing — “We also multiply the frequency by at each step, but it is easy to see that the function is still 1-periodic, although it may also be, e.g. 2-periodic. Moreover since we are increasing the periods by integer factors, the period of the sum is determined by the smallest of the periods, which is 1”. Did you mean largest period and smallest frequency instead? Because the period of sin(2*pi*k*t) is 1/k. In the sum sin(2*pi*t) + sin(4*pi*t), the term sin(2*pi*t) has period 1 and sin(4*pi*t) has period 1/2, so the period of the sum should be the largest of the periods (or smallest of frequency). Please correct me if i am wrong. Yes. The main point there is that the sum of two 1-periodic functions is 1-periodic. All that we really care about is that the collection of 1-periodic functions forms a vector space, and hence we need to be able to add them together and still get 1-periodic things. Q: How does an orthonormal basis guarantee this? I find it hard to wrap my head around it, especially considering the fact that this is an infinite-dimensional space. 2. We want the theoretical guarantee that our approximation only gets better for picking large n. The proof of this fact is again given by our basis: the complex exponentials form a complete basis with respect to the norm. Good questions. Unfortunately the convergence issue is very tricky. Mathematicians have spent a lot of time coming up with counterexamples to the many kinds of convergence, and these results are beyond the scope of this blog (and my patience for measure theory). The important point to note is that is a very nice space of functions: it just happens to work out that everything converges in the ways we care about. If you relax to just any old periodic functions or any old continuous function, then you start to lose convergence (for example, is pretty bad with this respect). If you want more detailed information, you should pick up a book on measure theory (like Folland’s Real Analysis), or see the Wikipedia page on Fourier convergence. As to completeness, this just means that the span of the basis is dense as a topological subspace. i.e., every point in the space can be estimated to within arbitrarily high precision, as measured by the integral norm. It turns out that picking larger and larger provides an explicit way to realize the density claim. Thanks for the feedback! I realize that convergence is a tricky issue. Some day, if I have enough free time, I might be brave enough to look at the Real Analysis book you suggested.